When I got back at the beginning of last week from our stay in Hong Kong, I noticed that the beautiful magnolia tree that I see from our office window was almost ready to break into flower. Instead of being thrilled (as I usually am), I was dismayed. I said to my husband “What will happen if we get a freeze? We are not even half way through January yet! It’s two months early. ” And of course by the weekend temperatures had dived and the tree was covered with snow. I was panicking needlessly, of course! I am no horticulturist, but on closer inspection I can see this tree looks sturdy and healthy. Also I have been assured that it is well cared for and has been slowly growing in its home across the road for many years. Yesterday I was discussing this subject of steady slow growth and constant nurturing in relation to confidence building with a colleague. 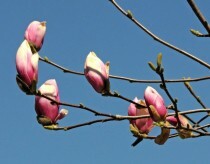 Of course, like magnolia trees we may encounter periods in our lives when the climate around us encourages a sudden rapid growth spurt. Getting a lucky break with a job or happening to bump into Mr or Mrs Right in a supermarket queue may instantly shoot us into the “Super Confidence” zone. But unless our inner core of confidence is firmly rooted and continues to be nurtured, we will remain prey to other people’s agendas and bad luck. My Magnolia tree has three robust trunks. Super Confidence has four ‘trunks’ that keep it sturdy: Self-love; Self Knowledge; Clear Direction and Positive Thinking. Your Confidence Challenge this month is to set some goals for yourself to ensure that these key personal qualities will stay sturdy through whatever challenges 2016 may bring. Now it’s time for action! Name one resolution you will make (and keep!) for each of these four core qualities of inner confidence. Very best wishes for a great 2016! interesting and varied challenge this month. I’m badly in need of some confidence after the abortion of my son. My girlfriend and I split up because of this she and I have no contact. I’ve now married and as I don’t want my wife to know I’ve written to you I’m using the e mail of a friend of mine.